I have recently completed my "wagon project" - adding loads and ropes/straps where required. We all like container traffic as it adds a splash of something different. 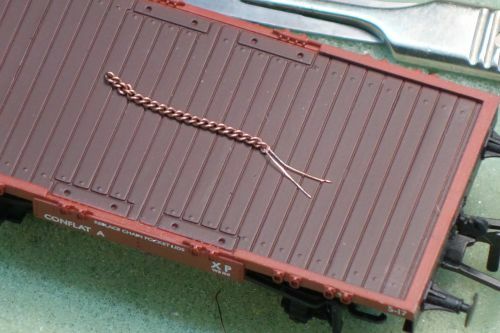 I thought I would share my methods of adding chains which secured the containers to the Lowfit wagons. I take no credit for the method as I have probably pinched it from somewhere but I hope that is of use to others. 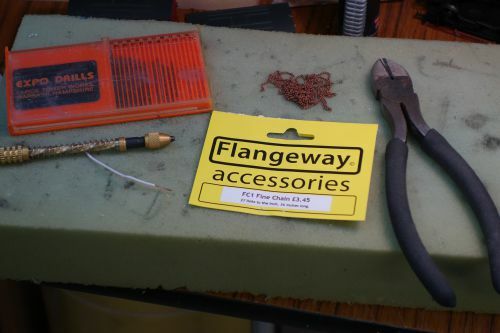 The tools for the job - number drills (I used No 78) and a suitable drill, Flangeway fine chain, multi-strand bell/layout wire, sidecutters (although I found that a scalpel did just as good a job cutting the chain). Not shown - fine pliers and superglue. This is where I started. I had 1 small and 3 large Container A's to do. Once I honed my skills, I set about the 10 fish containers that appear as part of my ex-Grimsby Class C (Fish) Freight. The first job is to cut a piece of chain to roughly the right length to stretch between the securing ring on the container and the securing ring on the wagon. I cannot stress how important it is TO HAVE A GOOD SERIES OF PROTOTYPE PHOTOS to work from - the internet is a brilliant source of good material. This makes sure that the final job will look realistic. Cut about an inch of one strand of the bell wire and thread it through the last link of the chain as shown above. It will be advantageous to have one leg longer than the other - see below. 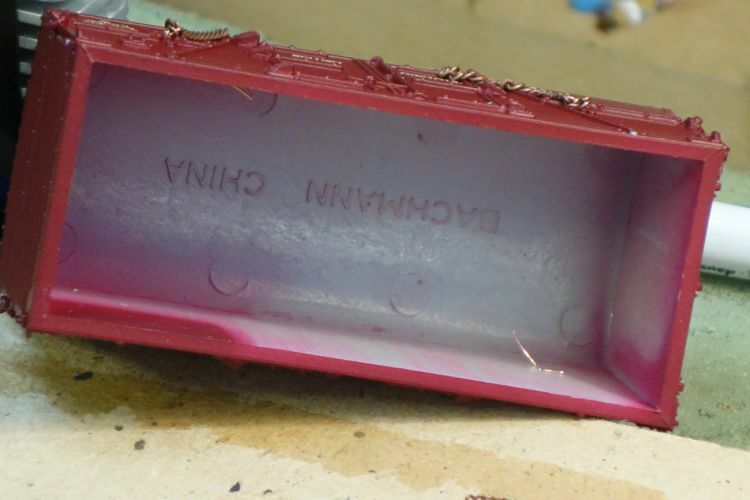 Now drill a No 78 hole through the container through the secruring ring moulding. Thread the legs of the wire through the hole and spread inside the container just as you would a split pin. Note that this threading and splitting process is easier if one leg of the wire is longer than the other (split pins also have this feature). Once inside the container, the legs are spread and pulled tight - a blob of superglue stops them moving. Four chains per container will give you this. Now glue the container to the Lowfit. Note that single containers were generally loaded in the centre of the wagon. I have seen photos of containers at one end but this seems a lot less common as it (presumably) unbalances the wagon. Now drill No 78 holes through the moulded securing rings on the chassis referring to your photos to ensure that the correct rings are used. Carefully trim the chains to the correct length so that when secured to the wagon, they will be tight. I found it useful to cut the chain 1 link shorter than I thought it needed. Thread another piece of fine wire through the final link and thread through the hole in the wagon chassis. This is the most difficult part of the job as you have little to play with. Pull the legs tight and do the split/pull/glue thing again. I found that the securing holes could be drilled into the base of the wagon and therefore the wire legs sat underneath the solebar and out of sight. They were trimmed as short as practical before gluing. The photo below shows how the wire legs disappear on the final job. And this is what you end up with - ready for the road. Once the wagon has been weathered, the appearance of the chain will be improved. Are there any web sites you would particularly recommend? 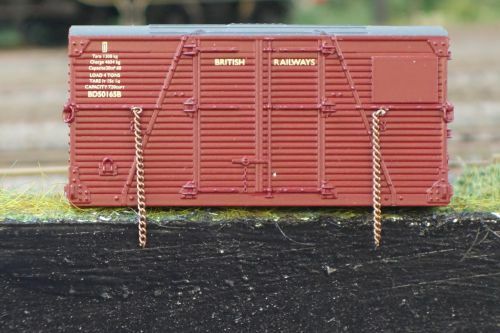 To be honest, I just Googled "British Railways Containers" and then clicked the Images tab. 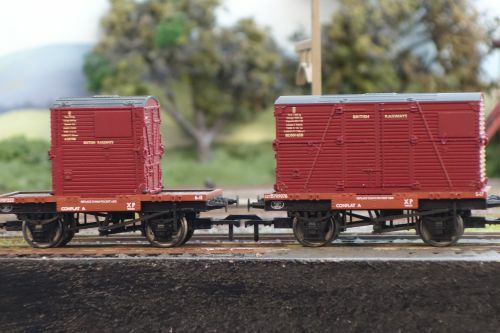 I tend to collect/save photos of real wagons rather than pictures of models - if the modeller has got it wrong, you are just copying the error. One drawing I looked at this time around was credited to alancaster149. I do not know this guy but he has posted some good reference stuff. Clearly I cannot publish or re-use his stuff for copyright purposes but he is worth looking at. I do have one issue with his container drawing though - he has the single containers loaded sideways - that is with the curved roof across the wagon. I cannot find any photos to support the view that they were loaded like this so I have loaded all mine front-to-back. However, his drawings show the various chain positions which are all supported by the photos. There is a super picture of an AF (white) container on a CONFLAT which appears on the Wikipedia site. The subject looks like it lives on a preserved line. I notice a couple of errors/omissions in my piece above. I glued the containers on with Superglue - I always use the gel for greater control and it prevents the embarrasment of sticking your fingers to the model!! The Wikipedia picture above clearly shows that the chains have a turnbuckle tightening device in the middle and that the top fastening is by open hook, not a closed chain link as on my examples. I claim Rule 2 - if it looks OK from 24 inches, its OK. Nothing more to say!!!! I have started the fish containers which have required a slight alteration to the technique. In order to get the lower "split pins" through the chassis, I have had to dismantle the wagon. 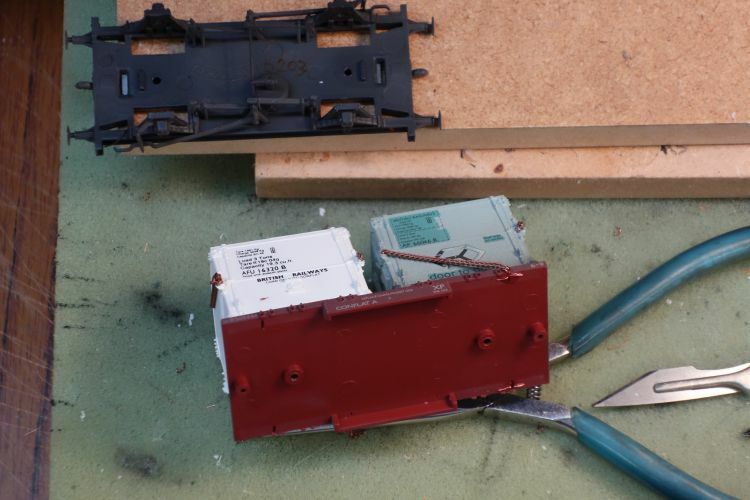 These are Bachmann Conflats so removing the two screws that secure the coupling housing also releases the underframe from the flat body. Note how I have cut the legs of the split in short once they are on the underside of the body and you can just make out the blob of Superglue stopping the pin from moving. Here is the first wagon completed. 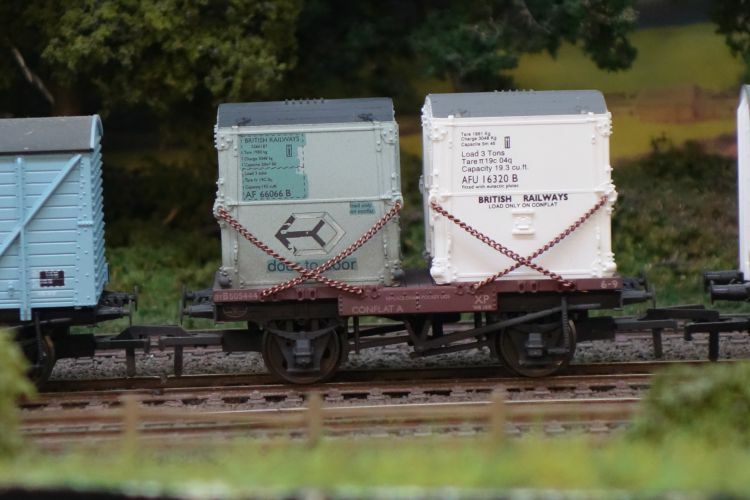 I found it quite hard to track down decent photos of these wagons carrying pairs of containers so I hope that the securing rings I have used are right!! One final thought - I have got very stubby fingers, I can't see anything without my Optivisor and I have the patience of a 2-year old. If I can do this, anyone can so if you think this sort of thing is of interest, have a go and surprise yourself. Found this in Paul Bartlett's collection of photographs - a photo of three small containers on a conflat that you could model if you can find suitable containers. I could not find a picture of 2 AF's on a Conflat A, only on a longer vehicle - perhaps a plate wagon or the longer Conflat B - but the chains were crossed. On the longer wagon, the outer chains went outwards and the inner chains went inwards but the two inner chains did cross each other. There is a diagram posted on Google Images by alancaster149 showing this. As I have said, there are some issues with this diagram but I am prepared to trust most of it based on the photographic evidence I have found. He probably has a bigger library than me so I'm starting no fights!! I have found evidence of 2 A containers on a Conflat A with the outer chains secured to the inward ends of the buffer stock and the inner chains crossed and secured to the securing rings. However, this looks rather unsafe and I wonder if the containers would have survived a rough shunt. Perhaps they were empty and therefore posed less of a risk????? There is plenty of evidence of single A type containers on Conflats secured by ropes or chains but all the photos I have found showing B type containers show chain fixings. The Ideal Stocks Committee did not have a container carrier on its books (despite the introduction of containers in the mid 1920's) but the GWR Conflat was perfectly serviceable and was copied by Wolverton and Swindon - at their peak there were 20,000 of them in service!! Conflat A's also passed into Departmental service in the late 1960's - some becoming shunters trucks without having been altered. Dave's picture is the real version of the old Triang container L wagon - the containers hold bulk powders I think and may have been lighter (in weight) hence the chains coming to a central point. I have not found a photo showing A-sized containers chained in this way. There is a great photo of this type of wagon with the containers chained exactly as Paul Bartlett's found on page 62 of Robert Hendry's British Railways Goods Wagons in Colour. To confuse matters more, I have just chained up a Container B (basically twice the capacity of an A type) into a low sided fitted wagon. There is plenty of photographic evidence that this was done with the chains running from the outer ends of the container to the securing rings in the floor at each end of the wagon thus creating a very steep angle in the chains. This method is however strongly supported by the photo on page 30 of "Freight Train Operation for the Railway Modeller" by Bob Essery showing a Type B (equivalent) in LNER days chained exactly thus onto a Conflat S (same wheelbase as an A). Above it is a single Type A on an equivalent Conflat A so alas, no Conflat A with 2 x A containers. 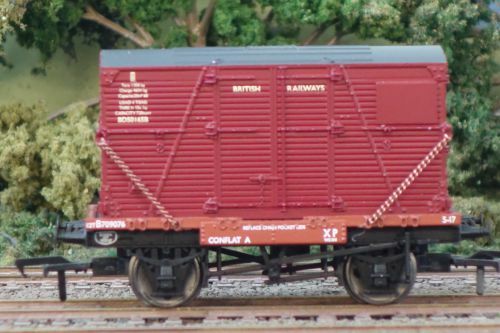 Incidentally, I have just put together a train consisting of 2 x Weltrol's each with a boiler load (Bachmann supplied) and there is a photo of a L&YR "36 ton Boiler Wagon" on pg 27 of Bob Essery's book showing how these should be chained in. I have seen dozens of these wagons on layouts with no chains or ropes securing the load. Similarly, the Hornby LowMac with the wooden box load. I use the optivisor for fiddly stuff and always work under a strong angle poise light with a daylight bulb. If I can't see it under these conditions, I have to wonder if it's worth fitting it!!!!!!! !